The name for stuffed cabbage rolls in the Ukrainian language is “holubtsi.” There are many versions of how this word appeared. One of them is that the word “holubtsi” derived under the influence of the French cuisine, that was popular in the second half of the XIX century, when fried pigeons (“holuby”) rolled in cabbage were served. Ukrainians and Russians modified the recipe and came up with a more affordable way of cooking. 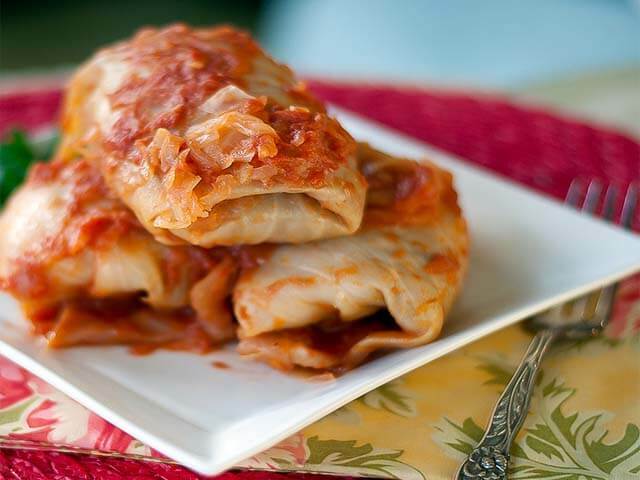 Ukrainians started to stuff cabbage rolls with meat and rice and cooked them with tomato juice or paste as a sauce. Today these are the most widespread ingredients for cabbage rolls. However, there are dozens of other variations for fillings in different regions of Ukraine, including meatless ones as well as different combinations of meat, veggies, and grains. For wrapping Ukrainians use fresh or pickled cabbage leaves, in the spring time replaced with grape leaves in the southwest and with red beet leaves in other parts of the country. The cooking liquid may be tomato juice, broth, and sour cream. 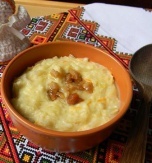 In the west of the country corn grits were extensively used as a filling and in the Eastern Ukraine buckwheat groats were well liked. Lightly cooked grain was combined with fried onion and pork cracklings and only on holidays minced meat was added. At first cabbage rolls were fried, and then placed in a big pot. The sauce was made of kvas, meat broth, or kvas mixed with water. Sometimes sour cream was added, as well. The pot was put in а well heated oven and taken off when cabbage became tender. The size of cabbage rolls also differed. For instance, in the Left-Bank Ukraine holubtsi were made from the whole cabbage leaf, so they were big, while in the west a cabbage leaf was divided into several pieces, so the rolls were smaller. We’re gonna to cook baked stuffed cabbage rolls. It this fabulous, scrumptious dish, cabbage leaves are wrapped around a balanced mix of ground pork and rice seasoned with black pepper and garlic. I’ll use pork, but you can take whatever ground meat you happen to have – chicken, beef, turkey, or even their mixture. If you want a lighter version, then it’s better to use chicken. To get heartier dish, you can add chopped bacon or salt pork to the ground meat. Wash cabbage leaves, put them in salted boiling water, and cook 1-2 minutes until soft. Take out the leaves from the pan and wait till the water drains. Cut out a thick center part of each leaf at the bottom of its stem. Now let’s make a stuffing. Peel and chop a bulb onion. Wash, peel, and grate a carrot. Fry the onion and carrot until they get a golden color. Wash and chop parsley. Rinse tomatoes (you can take off the peal if you wish) and cut them finely. Wash rice and boil it until half done. Peel garlic cloves and crush them. Mix minced pork, rice, garlic, tomatoes, and parsley together. Stir everything thoroughly. Season the stuffing with salt and ground black pepper. To roll holubtsi, put a cabbage leaf on a flat surface with the stem end facing you. Place about 2⁄3 cup of the filling in the center of the leaf. Fold in the sides and roll the leaf over firmly to enclose the filling. Then tap the leaf under itself to create a tight bundle. Repeat with the remaining leaves and filling. Arrange stuffed cabbage rolls in a saucepan next to each other so they won't unravel. Pour boiled water above holubtsi and add the mixture of fried onion and carrot. Simmer the rolls in the oven for 20 minutes and then pour sour cream above them. Continue to cook for half an hour until fully done. Since these Ukrainian cabbage rools can be served hot or at room temperature, they are great both as a warm comfort food on a chilly day or as a hearty appetizer to serve your guests at a party. 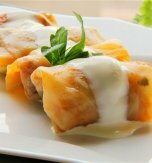 Serve cabbage rolls with a generous dollop of sour cream. 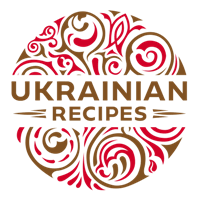 Do you have a favorite Ukrainian recipe for cabbage rolls with pork and rice? If so, please let us know in the comments below or write us an e-mail.